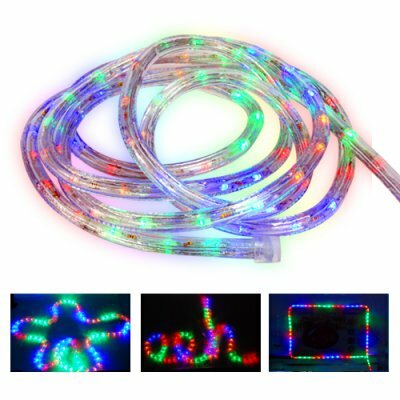 Successfully Added LED Rope Light - Color Changing Flexible Rope Light (10M) to your Shopping Cart. Flexible color-changing LED rope light in 10M length used to illuminate displays, signs, landscaping, windows, doorways, facades, or other areas that need decorated with light. Note that when using this outdoors, while the rope light itself is waterproof, the power supply IS NOT. The power adapter and controller MUST BE KEPT DRY AT ALL TIMES. Yes. It can be used on any any tree. This 10 meter length can highlight many size trees. Dropshippers - Our current series of color changing LED lighting products has continued to be popular since we introduced them last year. This is a product that will net you some steady sales from people looking to embrace LED technology. Our Retail Partners - save on your overall product cost by ordering this in at least 4 pieces in order to receive the absolute best value for your money; better price + better per unit shipping cost = better savings for you!